After processing a job, your molds will normally have some monomer residue and flashing stuck to the surface. All excess debris must be removed before the mold can be used again successfully. Cleaned molds must be stored properly to guarantee mold safety while the mold is not in use. Also, proper mold storage simplifies the picking process when the mold is needed again. Molds must be cleaned after each use. Molds should be left in the soaking bins for at least 5 minutes before cleaning. Scrub molds thoroughly with the disposable mold scrubber pads. Pay special attention to edges. Rinse molds with running water if it is available. If running water is not available, use a container of tap water. (Remember to change the rinse container water frequently.) Spray rinsed molds immediately with Q-Spray and wipe them dry. Never store a wet mold. TIP: Thoroughly clean and dry all molds. Anything left on a mold can cause an issue the next time it is used. This includes water spots. The Q-2100 Lens System comes with several hundred digital free form molds. It is very important that they are stored properly in order to keep them organized. Each space in the mold storage unit is labeled for one specific mold. Make sure the mold you place there is the right one. Pick a clean and dry mold. 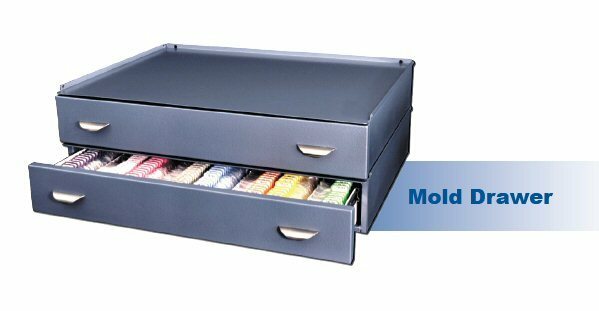 Read the mold designation near the edge of the mold and find the proper storage location in the storage unit. Put the mold back into its wrapper and put it into the allotted space. Do not put a mold into a space that is already occupied by another mold. Be careful not to bump molds against anything while storing them. TIP: Always store molds properly. The protective wrapper prevents scratches and can help identify molds. Return molds to their proper storage locations so you can find them quickly.